You can work out 24 hours a day, seven days a week, but unless you’ve got Talking Bellies, your six pack won’t be packing any personality. Talking Bellies temporary tattoos are the hilarious way for fun lovers, big and small, to turn their abs into puppets! You’ll have tons of fun mixing and matching different facial features to make six different hilarious creations. 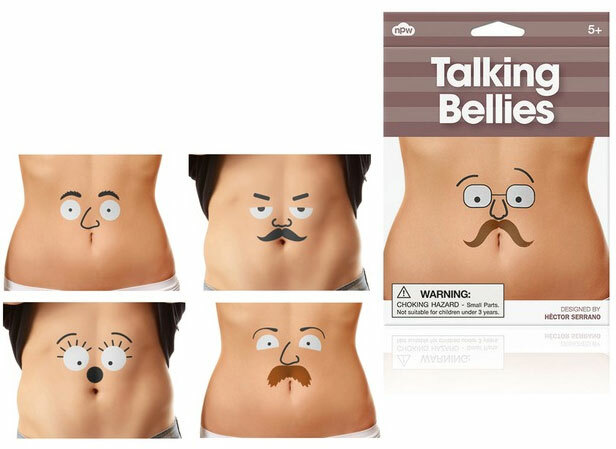 The Talking Bellies temporary tattoos set includes 6 eyes, 6 noses, 6 mustaches and 6 eyebrows. But where are the mouths? Your bellybutton provides the missing piece of your unique creation’s face so every tummy mug is a one of a kind! We love the Talking Bellies Tattoos because they make taking your shirt off fun. We all aren't joe six pack abs. But we all like taking our shirt off at the beach or the pool or the local watering hole. With Talking Bellies Tattoos, you won't feel ashamed about your not so tight bod. In fact, after seeing how fun and hilarious these tattoos are, people will beg you to strip down and show off your no longer bare chest. Brilliant!